Where has January gone? It disappeared in a few flurries of snow that sprinkled the city white and pretty and were swept away in a wink. It was devoured by raclettes and tagines, spicy lentil soups, and the best chocolate brownies. And so, suddenly, hello February. Today you are my favorite month. After a couple of unnaturally warm days the cold is back, which is as it should be. It seems I wouldn’t make a very good Texan, because I prefer slaw without mayonnaise, This isn’t to say that I don’t like slaw with mayonnaise, I love coleslaw in general, even the limp overdressed versions of average diners. But, given the choice, I prefer a citrus-y, Asian-inflected variant. 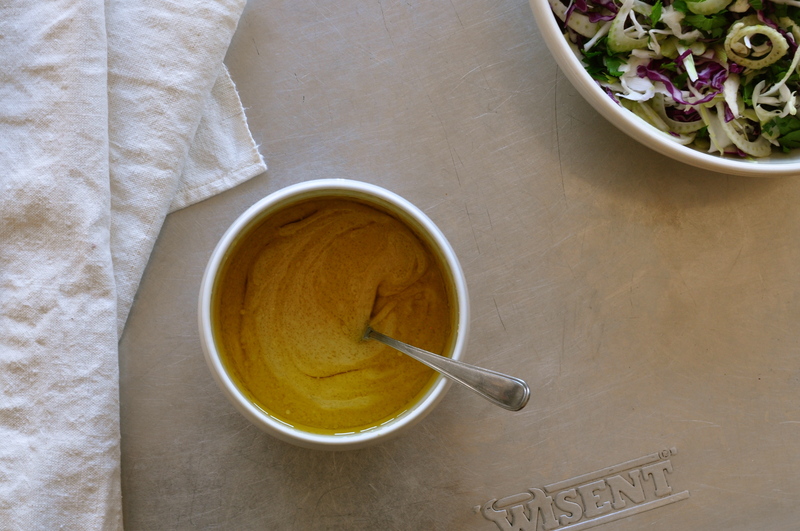 This miso ginger dressing is adapted from the beautiful blog 101 Cookbooks. I added fresh grated ginger, lime juice, and reduced the sweetness for something more assertive. Slice all the vegetables very thinly, using a food processor, a mandolin, or a very sharp knife. Mix together the grated ginger, miso paste, mustard, and honey until they are all well combined into a smooth paste. Add the lime juice and rice vinegar, stir well, and finally the olive oil. 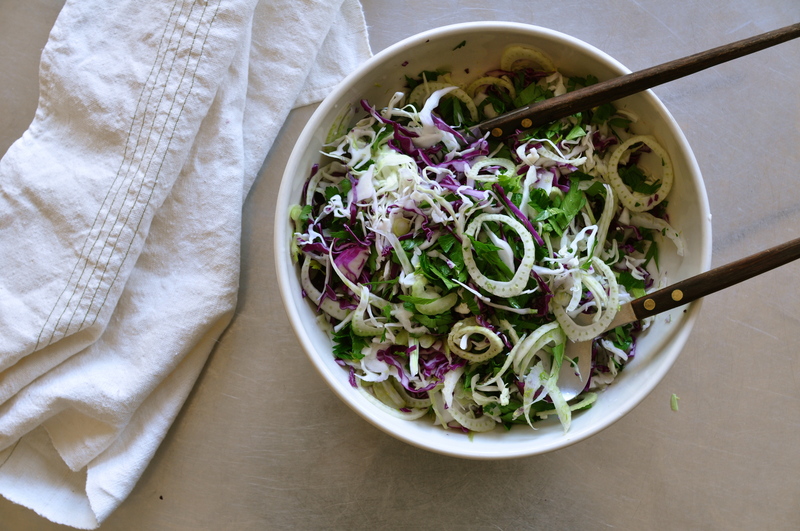 This entry was posted on 1 February 2013 at 14:17 and is filed under Basic, Easy, Salad, Vegetarian, Winter, Winter salad. You can follow any responses to this entry through the RSS 2.0 feed. You can leave a response, or trackback from your own site. Looks delicious, would be great with some finely sliced Brussels sprouts tossed in there! I bet this is a crunchy delight! Thanks, Stacey. 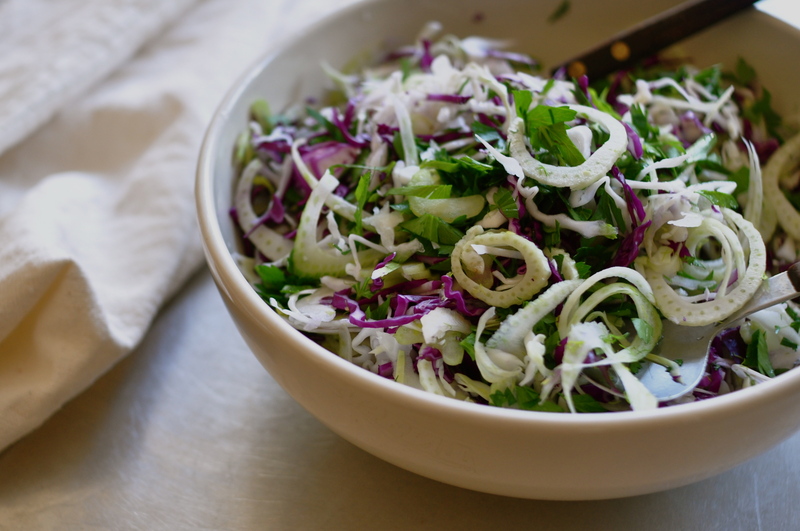 Yes, this salad can be modified in many different crunchy, wintery ways! Best thing about February? I can see spring on the horizon. What a wonderful looking salad! Yes! But … there’s nothing like a few really cold weeks to thoroughly look forward to spring! Thanks, Michelle. Looks fantastic! What a great dressing for winter greens. Thanks, Daisy. This dressing really nails it, I love it!